In a previous video, we did some short exercises to build hand independence, and one of them was a canon. We’ll be expanding on that quite a bit more today. In another previous previous video (linked above), we talked about why canons (and inventions) are so good for you to learn as a piano player, since they build hand independence. Today we’re going to apply that knowledge and practice a short canon together. The piano exercises I’m linking to actually contain 200 short canons, not just 1. They start at a beginner piano level and go up to about a grade 3 RCM level. If you’re looking for more music to sight read, this collection might be a good choice for you. You could always spend 5-10 minutes reading through a canon a day. Just by doing that, your hand independence will improve by leaps and bounds. The canons can be found over here on imslp.org. Let me know if you guys are interested in me doing a play-through of these canons. I still have a couple other play-throughs on the backburner, like Bartok’s Mikrokosmos, but if there’s interest I’ll look into it. The collection of piano exercises we’ll be looking at today is called “200 Short 2-Part Canons, op. 14” by Konrad Kunz. The specific piece we’ll be playing is the op. 14, no. 95 canon, in F major. This canon is actually in the RCM syllabus for RCM grade 2, as a list C piece. List C pieces at this level are always inventions and canons. So if you wanted to practice this song for an official RCM exam, you could. These piano canons aren’t particularly famous, and neither Konrad Kunz. He was a German composer in the 1800s, and a music director. He wrote a lot of music for male choirs. This is the only composition in the entire piano syllabus that he wrote. Still, despite all that, fame isn’t everything. These aren’t the kind of piano exercises you learn to show off to all your friends, perhaps, but they’re excellent for study. We’ve talked about piano canons several times on this channel. The previous video was dedicated to piano canons, and we also did an analysis of the famous Canon in D.
But for the purpose of this tutorial, let’s do a quick recap. A canon is a type of invention. Inventions are pieces based on imitation. So canons are imitation pieces. The catch with canons is that they usually involve exact imitation. In piano, what that means is that one hand will play a part, and the other hand will imitate it. You can see why canons on piano make such great hand independence exercises! Now let’s move on to the tutorial. Let’s take a quick look through and do a quick analysis before getting into it. 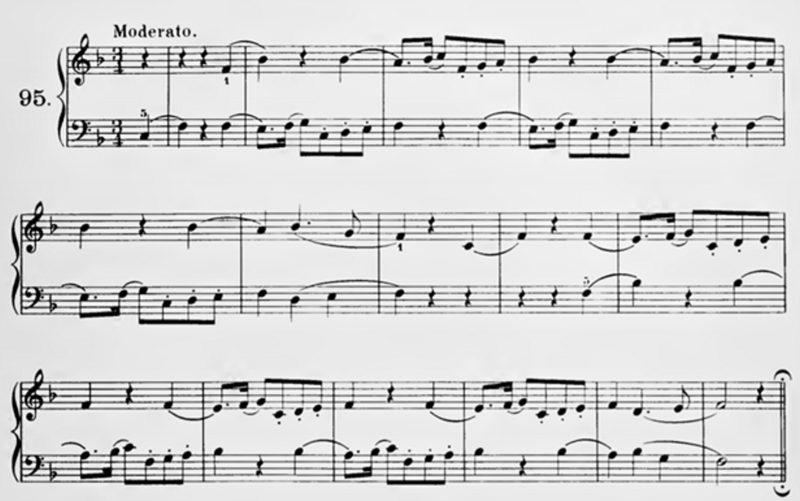 You can see this rhythmic motif – a repeated rhythm pattern with dotted 16th notes followed by some 8th notes. Remember in our musical fruit episode, we called the dotted pattern “co-co-nut”? Let’s use that to help us with the rhythm. The other rhythms are easy. Next, let’s look at the key signature. Well we’ve got a Bb, and we start and end on an F. So we can say with certainty that this is in the key of F.
The time signature is ¾, which is a little more challenging. We’ve also got an upbeat throughout the piece. Notice how the first bar is incomplete – there’s only one beat there! But in ¾ time, each bar is supposed to equal 3 beats. When this happens, it means the piece isn’t starting on beat 1, but rather beat 3. You’ll notice the upbeat throughout the entire piece. You’ll also notice that every upbeat has a slur. So you’ll be slurring beat 3 to beat 1 throughout this piece – remember that once you start playing. And now, let’s go and find the “imitation” aspect of this canon. Clearly, the left hand is the leader of this canon. And if you look to the right hand, you’ll notice it’s copying the left hand exactly, except delayed by a few beats. That imitation is interrupted on bars 7-8 for a nice little cadence, and then we resume imitating, this time with the right hand as the leader. That’s why I really like this canon – it’s a good balance of both the right hand and the left hand, since you have to practice your imitation skills in both. The easiest way to learn canons is to learn them hands separately. Because if you’re insecure about either hand, putting them together is going to be a nightmare. The melody in each hand has an important pattern of slurs, staccatos and rests. If we don’t get comfortable with this hands separate, the first thing to go will be these slurs, staccatos and rests. And these are the details that define the melody, so we want to make sure they come out. Once you’re comfortable with the tune in each hand, and you don’t feel like you’re struggling to read or play it, then it’s time to put it hands together. Again, since playing canons on piano is such a brain work-out, give yourself a chance to do it correctly by slowing way, way down. Besides, our top tempo is “moderato”, so there’s no need to rush through this. The nice thing about this canon is that the faster parts happen while the other hand is resting. So while you do have to multi-task, you have more mental space to focus on the difficult parts. I hope you enjoyed this tutorial on piano exercises – definitely check out Kunz’s 200 canons for sight reading, and general piano technique practice. Composed by K.M. Kunz. Classical. Score. 47 pages pages. Published by Editions Combre (LM.EG07700).